Pix2Fone is a simple and free webtools which allows you to upload any image on your PC to your cellphone. You just have to choose an image on your PC, select the model and manufacturer of your cellphone and then you have two options to upload the image on your cellphone. Download it to your cellphone via WAP: You are given an image code, note it. Go to wap.pix2fone.com in your phone's browser (Take note of the f in the 'fone' when entering the WAP site address) and enter the image code. The image of yoru choice is downloaded to your cellphone. If your mobile service provider provides you email id linked to your mobile number (like phonenumber@mobilenetwork.com) then this website sends an SMS to your cellphone, which contains a download link. But here also WAP connection is required to download the image to your cellphone. It really easy to use. Try it. Firefix is the browser of choice of millions of the savvy Internet users around the world. But one of the astonishing shortcoming of firefox has been the non-availability of the Alexa Toolbar, which helps to increase the traffic statistics of a website. There have been a few webtools as a replacement of Alexa Toolbar. One of them being SerachStatus, a firefox add-on, already discussed on this blog here. Community based sites are growing like never before. The biggest advantage of community based sites is that they are user driven. The promoters of the sites are not required to create content, they just have to put the systems in place and the content is created and shared by the users themselves. The revenue model of most of these sites is based upon Google Adsense, which generates enough revenue to run these sites. Latest among them is InviteShare.com, which is basically a place which lets users share the invites for the new websites and services. Get registered there, find the service to which you want to get an invite and register your request. Some other user will send you an invite. The trick here is that, the more you send invite to others, the more are your chances to get the invite you desire. Simple trick, but big potential. There have been a few posts on this blog about picking color codes from a pixel on your screen, which you can find here, here, here and here. Now I want to give a quick tip, which has helped me immensely in deciding the color themes of few other blogs. Color Blender is a simple, yet effective webtool, where you can choose any two colors and this site blends them different proportions and provides you many options to choose from. The different output shades are as per the number chosen by you. If you choose to get 10 shades, then this tool provides you the 10 colours, alongwith their HEX / RGB codes, all equally distant from each other. You can you these colours wherever you wish. 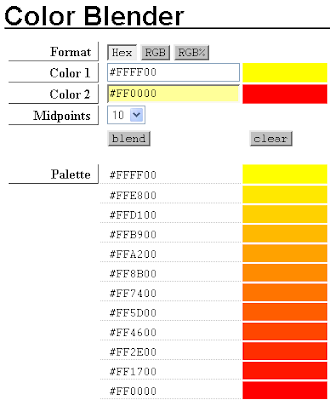 See the example where I have obtained 10 equally spaced shades between color #FFFF00 (yellow) and #FF0000 (red). When I started this blog, I was a total novice at Photoshop. I new that this is a powerful tool, but didn't know much about how to operate it. Besides this, I didn't have the license also and didn't want to spend hefty amount purchasing it. So, I decided to try Gimp, the freeware, opensource solution, which practically does all the jobs of tweaking an image. 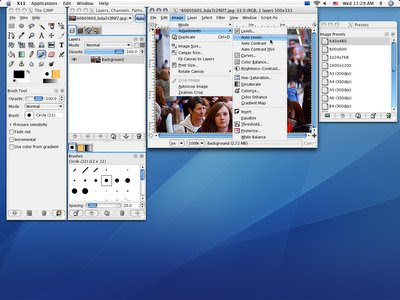 But those users, who are adept at using photoshop, find Gimp a bit difficult because of its different interface and different menu structure. To solve this problem, Gimp has now introduced GimpShop, the cousin of Gimp, which has most of the menu structure and other features similar to Photoshop. Let's see the next move of Photoshop. A new website that tests your knowledge of technology and the internet has been launched. How e are you? (www.howeru.com), is a simple and newly launched website, which tests your knowledge about Internet and tells you, where you are alacking and also lets you know the websites you ought to visit early so as to plug-in those holes in your knowledge. It is a UK based site and is promoted by Online Consultancy Enhance Media. "It will be intriguing to see the results. We all probably think we use the internet pretty well. But it's a fast moving medium and there's always going to be someone who's found something you don't know about, but that you could benefit from," said Elkington, the man behind the project. Now you can carry your favorite computer programs along with all of your bookmarks, settings, email and any other thing you like with you. There is absolutely no need to leave any of your personal data behind. All this is possible with PortabeApps Suite. The best part is that it is absolutely free, no trial versions, no spyware, don't require you to give your email address. It is basically a suite of programs bundled into a single setup kip and can be run from a removable device like USB Disk. The platform is open source and more and more applications are going to be added. I love Snagit for taking the screenshots of different for this blog. It is probably the most versatile software, with lots of cool options to tweak the screenshot. But, most importantly, it is not a freeware. You have to purchase it to use it legally. But, there is also a great freeware, which does most of the jobs Snagit can do. It is FastStone Capture. It is lightweight (only 1340 kb) and offers the output in a variety of formats. It allows you to capture anything on the screen including windows, objects, full screen, rectangle regions, freehand-selected regions and scrolling windows/web pages. You can download it here at PCWorld or directly from the FastStone website. Kruptos is a robust 128 bit file encryption utility, which allows you to safeguard your important files on your hard disk or portable storage devices by utilizing its powerful file shredding capabilities and the ability to generate self decrypting files. It runs on Windows 2000 or XP through MS .net framework. The best part is that it is free, simple to use and easy to install. No spyware, malware or malicious scripts. No method is deviced to break the password. If you loose your password, you loose your data. Simple, but effective. They claim it to be ideal for secure trasportation of files on potable storage devices, such portable hard drives, USB storage keys. Many times webmasters and bloggers need to know the hex and RGB color codes of a particular shade of a color. There are many ways to do that. Some like ColorCop, ColorPicker and another tool have already been discussed in this blog. Now we found yet another cool free webtool, which directly copies the hex color code of a pixel to your clipboard, from where you can paste it to anywhere. The task made more easy. You have to follow these steps. 1. Download (485kb) Instant EyeDropper and install it. 3. Move your mouse pointer to its icon in the system tray. 4. Press and hold the left mouse button. Holding it, move your mouse pointer to the target pixel. Are you concern about the security of your systems. No we are not talking about the viruses, but the spywares and identity theft scripts. Although there are many programs and scripts, which clean your systems, but most of them are post-facto. They operate, when you are infected. One of the programs, which give you a pre-warning, i.e. warning before getting attacked by a malicious site, is SiteAdvisor. This plug-in performs a background check on the Web sites you visit and raises a flag, whenever you visit a dubious looking site. It also gives you a warning icon next to potentially dangerous results from popular search engines, along with an icon in your status bar that shows the risks and annoyances associated with the page you're viewing. SiteAdvisor was founded in April 2005 by a group of MIT engineers who wanted to make the Web safer for their family and friends. The pro version of this McAfee service adds features such as e-mail and IM link checking for $20 per year. The free version is available for download at PCWorld. Seems like all Google innovations are likely to get replicated by Yahoo. The latest being the search suggest. The feature of Google suggesting the keywords for your search as you type your query is quite old now. But as per this blog post by the Yahoo's Kevin Lee, the search suggest facility is now also available in Yahoo. Do you always fancy those web 2.0 like reflections to the images, which fade into background. But what if you didn't know the use of photoshop or gimp, and didn't have enough time and pateience to learn that. No issues. Follow this procedure to add reflections to any image on your web page. 1. Go to this cool website. 2. Download the zipped file "reflection". 3. Unzip it and recover the reflection.js file. 4. Load it to your template. For it, you have to upload it to a free file hosting site, and note its URL there. 5. Paste the following code to the template. Before pasting remember to replace the src value with the URL noted in step 4 above. 6. Now you are ready to add reflections to the images. For it, just add a class="reflect" to the image. 7. You can easily change the height and opacity of the refelction if you so desire. Most of us, who had seen the era of PC286 and 386, will remember the favourite timepass PC-Man. I should aptly say it a time-destroyer, instead of a time-pass, because I myself had spent hours before the screen just to surpass my previous highest score. 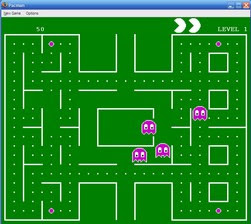 Now, there is firefox, extension available for this rivetting yet simple game. You can download this firefox add-on from mozilla site. Few of the most annoying thing for a computer geek during re-installation of OS or setting up a new computer is the backing up of bookmarks, transfer of emails and transfer of passwords. But, if you are using firefox, there is an easy solution. 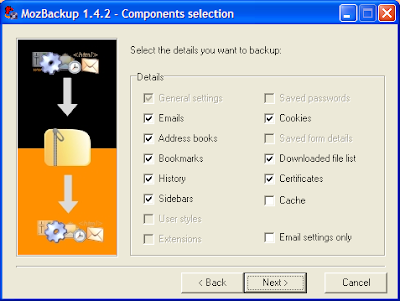 Now, you can backup your history, passwords, downloaded file lists, setting etc. using MozBackup. The interface is easy to use and lightweight. 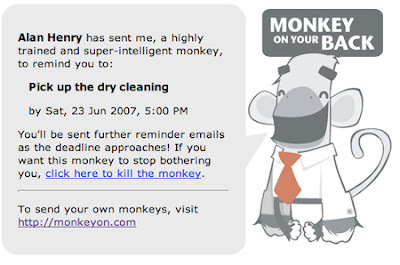 If you are planning to throw a party, or just want to send periodic reminders to somebody to do a task, then you can automate the process through this special webtool "Monkeys on your back". You just have to sign in and set up the task, and they will send personal email reminders to the target person(s) at the schedule determined by you. The interface is simple and fun to use. The recipent can choose to get further reminders or can also stop to get more reminders for a particular task. The service is free for upto five task, beyond which you have to pay. If you are planning to buy an iPhone oro any other model of latest cellphones, but worried about what to do with your old handset, go to MoPay. They will recycle it, or ship it to the third-world countries for reselling. In turn, you will be given a decent price for it and some of the proceeds will go to the charity. However, the price they offer you are almost half of the street prices shown. For instance, the working price for a NOKIA N95 is 132 British Pounds while non-working price is about 66 BP. OneDump is yet another file storage site, where you can host any of your image, text. audio, video file. The space is unlimited, but you can upload at most 10 files at a time each restricted to maximum 5 Mb. But why, why do we need just another file hosting service, when there already are plenty of them like DivShare, RapidShare, AllYouCanUpload, Flickr and many more. How they are going to sell their services. On this, OneDump claims that it offers a straight-forward solution that makes uploading and “sharing files easy as never before”. You actually don't need to register rwith them. Go to their homepage, upload a file, and that is it. You will be provided the link, which you can use or share. They also provide the facility to upload files through emails to the registered members. But if you want to avail other services like folders, slideshows, and an easy interface to upload and manage your stuff, you will have to register with them. The important part is that they are also planning to allow file uploading through cellphones. If you have never come across it, Flock is the special web browser which helps you a lot if you devote much of your browsing time to social and bookmarking websites. It was first released in October of 2005, and now after two years, they have come out with a feature-rich Version 0.9. So what’s new in this version ? Get updates and download flock here. One of the distinguishing features of Web 2.0 is the availability of cool badges and buttons for your use. They are probably one of the most popular trend in Web 2.0 time. They might have various round or square corners and eye-catchy colours. They immediately attract visitor's attention, it's most over-used trendy little design technique in our days. But how do you prepare them, especially if you are not a geek or photoshop / gimp expert. No problem. Try this cool site, and make your own badges. Hitting "Del" key doesn't delete the files from your disk. It only deletes its directory information so that it is not listed and identified by the operating system. But do you know, there are several softwares available, which can easily retrieve this file, leading to possible misuse of it by some unscrupulous person. Frightened, you need not. There are many programs available on the Internet, which does the shredding job for you. In fact they usually re-write the target file with a random string of data multiple times and thus make it unusable, even after retrieval. File Shredder (Download here, 1.5 Mb) is one such program, and it is free. It use five different algorithms to shred the target file into binary pieces. So next time you want to completely feel secured, use these softwares. Despite many ills and criticism, Sponsored blogging has its own advantages. Because if this, you the reader as well as I the blogger, get to know various new things, which may not be of direct interest to us. One such thing is racing car. I was never much interested in them, but this assignment, wherein I was asked to write a post on Top Gear, made to look and search various resources on motoring industry and this added to my little knowledge about this field. Top Gear is one of the UK’s premier motoring website, which offers you daily Motoring News, besides a lot of information on reviews of various cars, auto games and a huge database of new and Used Cars which you can buy or sell online. After that you have to answer a few questions related to auto industry. 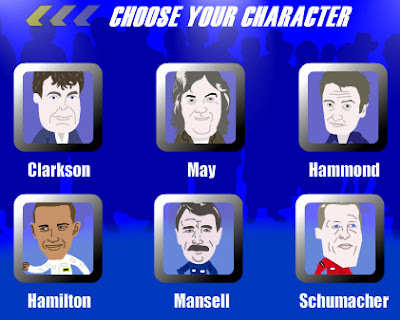 Answer as many Top Gear and Formula One related questions in the quickest time possible. The more questions you answer correctly in the quickest time, the higher your score will be. But one thing is sure, to answer the maximum questions you have to have knowledge about this world, and for this you are again referred back to the Motoring News section of this website. If you are a auto fan, this unique website also offers you download from a host of free wallpapers and screensavers, which can really vrooooom your desktop. These are also categorized in to different sections like most downloaded as well as most popular. Their distribution channel is also very huge. For every make or manufacturer there is a list of the dealers available right there on the website, where you can deal if you are interested in the purchase of used cars. This is a notification letting you know that your PayPerPost blog, Webtools, has been approved and is now available. You can now take opportunities and write about them on your blog. I received this e-mail today from payperpost. Today was the 75th day since I written my first post on this blog. Thus they have relaxed their condition of 90 days in my case. I always heard that they are a bit liberal in cases of good blogs, which are regularly updated. Seems like payperpost has liked by blog and so approved it. I am planning to take up few quick sponsored posts. Let's see how things shape up in future. There are many people in the west with a craze for Russian brides or Ukranian Brides. Why ? Because it is said about Russian ladies that they like to look pretty. They like to dress well. They are concerned about their weight, their hair and how they present themselves. It is believed that their overall attitude about themselves is feminine. But there are lots and lots on information about the Russian dating scams and how people have been cheated just because of this craze. But, there is st least one site, which is not a scam. We are talking about www.changeforlove.com. This site has a lot of services on offer. here you can genuinely find a date, browse through their latest portfoilos, talk with them, send SMSs or flowers or gifts and they can even assists you in organizing a meeting. True to their reputation, they also have a Search dating scammers guide, which assist you in searching, which dating sites are scam and whcih are genuine. They also have a section, in which the story, which is reportedly a coverage done by BBC of them, is presented. If you are interested you can contact them on their US toll free number 1-800-680-0832 or, alternateively, international callers can dial their number +7-8435-439839. Fellow bloggers, will agree about how important it is to check the appearance of your blog / site on all popular blogs, because it seldom happens that a site looks perfectly ok in all the popular browsers. Microsoft released Internet Explorer 7 a long way back and now it has already gained a decent market share of the hot browsers market. But with it, the problems of website designers and bloggers increase, because now they have one more browser on which they have to check and test their site for its appearance. The problems becomes compounded given the fact the installation of IE7 washes IE6 from your PC and you need two different PCs, if you want to see the results on both IE7 and IE6. So, is there any solution ? Fortunately, there is. And the solution is a third party installer named as Multiple-IE, which allows you to keep multiple versions of the same browsers on the same machine. Easy, isn't it ? Of late, this blog has been requested with many requests for writing a sponsored post on Plastic Surgery related services. I know, this is not included in the basic theme of my blog, but these sponsored posts are a way of earning money for this blog, so I have accepted this offer as well. In fact this post is about a blog itself about the Plastic Surgery News, the purpose of which is to provide you with the latest news and trends regarding plastic surgery so as to enable you to make an informed choice. This cosmetic surgery blog also provides you information about a tummy tuck as well. The content is good, article are informative, but there seems not many articles available. But one important thing, which I didn't link much on their blog was the absence of proper navigation tools. The only choice for you is to read every article page-by-page. There are no labels or categories for giving you an easy access to the content you desire. You can only find an "Archive" link on the Homepage, which takes you to a page, on which only four months are shown, and nothing else. These shortcomings should be addressed by the promoters of the blog to give easy access to the readers. Although this is a fact that this blog is not having years of experience behind it (The first entry on the blog dates back to 6th of April 2007), but the contents are good and seems to be written by a person, which can safely be considered to be an expertise in his field. So, if you are a person on the look-out of a place to get more know how on the subject before going for a operation or procedure, or just out of curiosity, I will definitely recommend you to at least have a visit to this blog, You might have a face a bit difficulty in going through the entire content, but it will surely be a rewarding read. This site will surely help you a great deal in evaluating the pros and cons of all your options before going for a surgery in this area. Despite the seemingly indispensability of emails, there is huge section of our population, which still cannot access it and are still dependent upon the paper form of communications. A new servicee eSnailer seemingly promises to bridge that divide. It allows to send you a letter in the form of paper in an envelope to anyone. The sender has to just fill in the receipient' and sender's name & address and the message in a form provided on their website. And the beutiful part is that this is absolutely free. But what is the catch. I have a six years old school going daughter, who is very fascinated to work on my laptop. Whenever she sees me on it, she tries to lay her hand over it and I have also started to teach her the basics of the cyber world. During this process, one thing I have noticed that the computer games, both online and offline, are a great way of learning basic skills. The basic skills on working on computers require good hand-eye coordination, which we, the grown up people, do not realize, because we are accustomed to it. But see a child working on a computer and you will understand the importance of what I am saying. In this situation, computer games are very efficient tools to let them master this skills, because they require excellent degree of coordination and at the same time keep their interest alive. So, while searching for the good computer online games, specially mahjong, I came across with this excellent website, MidoriTech.com, which is a relatively new company based in Burgundy, France offering entertainment products. The PC games are available on both platforms; you can find here PC games as well as Mac Games. One example of a great Mac game is mac solitaire. So, whichever is the type of your machine, you can always enjoy the excellent Kids games from Midori. Midori offers the purchase of softwares and games both online and offline. They say that their online payment system is powered by Plimus, a trusted and secure online payment system that uses industry standard encryption, and thus all your personal information, is safe if you chose the online payment method. If you don't want to do that, then you can print an order form, available online on the website and send the money alongwith your order to receive the games and software. Looking good is a feeling, which human beings have been relishing since the time immemorial. People spend a lot of time, efforts and money for it, but sadly, not succeed in many cases. This is because the medium they choose, the doctors they trust, for the accomplishment of their goal is not correct. But this is not the case with this website Plastic Surgery101, your trusted medium to satisfy your needs related to plastic surgery. Here you can choose from lot of procedures available like breast augmentation, Beverly Hills rhinoplasty, face lift or Beverly Hills liposuction. The main aim of this website is to create awareness among the people and procedures on plastic surgery. You can learn a lot on this site and clear your doubts and misconceptions about plastic surgery. This website also contain a very helpful Frequently Asked Questions section, where you can learn things like the difference between cosmetic and re-constructive surgery, how long will be the recuperative period or when you may be able to return to your work after the surgery. The website also contain a before - after section, which is usual for such websites, where you can compare the results of the procedure with the situation before. The best (and happiest) plastic surgery patients are those that make informed decisions. The information on this web site is provided so you have the knowledge necessary to make the best possible choices. And it seems, the website accomplished its goal of imparting useful information about the plastic surgery. 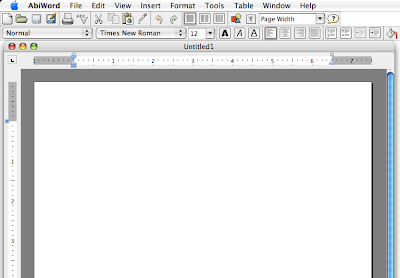 This is the fourth article in the series of free Word Processors (alternatives to MS Word). In this series, we have already reviewed Zoho Writer, Bean and RoughDraft. This post will highlight AbiWord. AbiWord is the lightweight, open source minimalist's word processor, capable of accompishing most of the functions of the heavy-weight word processors. It is part of a project popularly known as AbiSource, started by SourceGear Corporation. The source code of AbiWord has specially been written so as to allow it to function on virtually any operating system with a minimum of time spent on porting. It includes advanced word processing features like headers/footers, mail merge, table of contents, and auto fields, in addition to all the basics you would expect. The website is also very user-friendly, and accessing the information is easy. 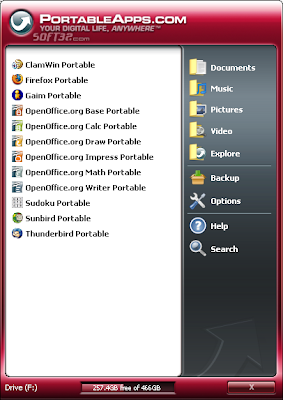 Multi-Platform - Abiword is not only limited to Windows but it supports another platform like Linux, Unix, etc.